Hint - The Chip's Challenge Wiki - The Chip's Challenge Database that anyone can edit! In Tile World, the hint has its own panel within the game window. Tile World 2 can accommodate additional text between levels, used primarily for storytelling. 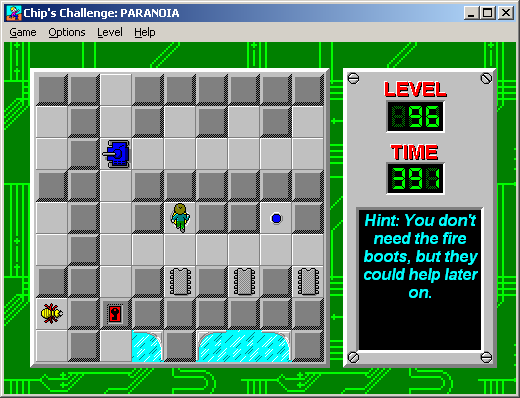 In Chip's Challenge 1, the hint is set for each level, not for each hint tile. Therefore, a level cannot have two different hints even if it had two different hint tiles. (Special is the only CC1 level with multiple hints.) However, in Chip's Challenge 2, each hint tile can have it's own hint. Thus, there can be multiple hints per level in CC2. The maximum length of the hint text in Chip's Challenge 1 is 255. If the hint exceeds this length, its level will not play, and the screen will instead show the picture of Chip at the end of the game, with a computer chip in his hand and held up by the Bit Busters. In MSCC, a shorter hint may still not display if it cannot fit within the hint panel. A lengthy hint can also contribute to a crash due to the Data Size Glitch. A hint can be written but not placed on the grid, in which case a level editor will reveal the hint; this has sometimes been used to chastise players for peeking in the editor. Hint tiles can also be placed in a level without writing any hint, which means the MS hint display above will still show, but with only the text Hint: inside, and no text at all is visible in Tile World. The most obvious uses for a blank hint are either to taunt a player seeking one, or quite rarely to use as a monster and block-acting wall in Lynx. When consecutive levels contain hints underneath the player moves through them using the Next or Previous commands in MSCC, the hint text does not change initially, but will revert to the level's stored hint if the tile is touched again. This was initially discovered in Eric Schmidt's level set, where all levels from 110 to 115 start Chip on a hint. Hints may be immediately available, but some are often disguised and can be made deliberately dangerous or time-wasting to reach: Crypts of Aganorak will be cooked if Chip reads the hint for  or longer, and simply stepping onto the hint of Pyramid will trap Chip behind a recessed wall. If Chip reads the hint for You Must Be Joking for too long, he will run out of time. They can include valuable clues such as the key objective of the level, buried items or where to find the exit (Ladder Needs a Wash), explain why the player has just cooked the level (Zelgon's Lair), fill in backstory important to solving the level or enriches the experience (Captured), or elucidate the level design and/or name if, perhaps, there are proper names, references or fictional locations that need such explanation. The Ghosts at the Massingham Mansion, Oil Rig, Super Chip, Get a Clue and And Then There Were... Four? are several such levels, whilst Chip Alone: Lost in Chip City's hint message references the movie Home Alone 2: Lost in New York in a way that the movie's plot is a hint to the player. Only 21 levels in Chip's Challenge 1 contain hints. With increasing difficulty in CCLP2 and CCLP3, more hints are included in these levelsets; CCLP3's running storyline also demanded more gap-filling. There are four missing hints (Deconstruction, Hmmm!, Ray of Light and CircleMaze) and 37 official hints in CCLP2, while CCLP3 contains 58 official hints and two blank hints - Vague Dream and Suspended Animation.